Ever touched someone and experienced a literal spark? Just walking on a carpet while wearing socks can accumulate about 12,000 volts in the body. On its own, this build up does discharge, but if you touch someone right after, chances are you’ll both experience a tiny shock! The human body can carry up to 25,000 volts of static electricity at any time. One of the dangers of handling any electric components — be it a laptop or the light switches in the kitchen — is this sudden discharge of static electricity. Between two people jolting each other in the winter, it would be merely a few volts, but in a say, a refinery, or a power plant, the result of even one spark could be calamitous. Amrita Poyekar, a research scholar at the IITB-Monash Research Academy, has developed an advanced material that can be used to prevent these sparks. Lightweight and versatile, her electrostatic dissipative material could be used to build a shield around wires or even made into protective gear that people in high risk environments could wear. Further down the line, it could even be used in the wiring of homes, offices, and schools. The ideal material would be a polymer or a polymer blend that is insulating, but also conducts electricity. It needs to be durable, rigid, strong, with high impact resistance. Additionally it needs to ensure no unwanted charge gets accumulated anywhere to dissipate in the form of a spark or fire. And it is this challenge that forms the basis for Poyekar’s research at the IITB-Monash Research Academy. The young researcher started with blending two engineering polymers: acrylonitrile butadiene styrene co-polymer (ABS), which is the highly impact resistant plastic used in making car bumpers, and polyamide6 (PA6), which is a nylon of high mechanical strength. 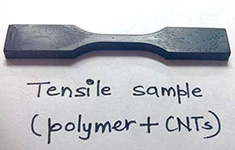 To make it conductive, she added some multiwall carbon nanotubes — rolled up cyclinders of graphene that are 1.5 micron long and about 9 nanometers in diameter and are electrically conductive. For perspective, note that a human hair is 80,000-100,000 nanometers, or 80-100 microns, in diameter. “These nanotubes are tiny, their length to diameter ratio is high, so they form a highly entangled coil structure like uncooked noodles. My aim was to disentangle them. However, I needed them not too far from each other, but in a network so they could efficiently conduct electricity,” said Poyekar. Her work aimed at finding the best way to disperse the nanotubes into the polymer blend by an exhaustive trial and error of various methodologies. Various strategies included sequential melt-mixing, where the polymer was heated to a visco elastic state after which nanotubes were mixed in, or a masterbatch approach, where the nanotubes were premixed in one of the polymer phases first and then melt-mixed simultaneously with the other component. The introduction of organic modifiers such as sodium salt of 6-aminohexanoic acid (Na-AHA) and 1-pyrenecarboxaldehyde (PyCHO) that interact with the nanotubes surface to help debundling the nanotubes by reducing the attractive forces between the nanotubes, but without altering their surface. The studies were carefully designed to recognize the effect of each individual step and component on the final properties. “The most challenging thing I found was that multiple factors, such as how we mix the two phases, in what concentration, their blend morphology, and introduction of nanotubes, the two organic modifiers in the presence of compatibilizers, the end phase morphology, and the electrical conductivity … each and every component influences the end properties very significantly,” said Poyekar. The final material is coal black, and moldable. For now, it’s expressed in a dumbbell shape, but the shape and texture can be changed for applications. The material has a conductivity range of 10-9 to 10-3 Siemens/centimeter, well within the application range for electrostatic discharge applications. In big refineries, with continuous flow of fluid with a low flashpoint, even a little spark generated is really dangerous. In such places, they should be shielded with ESD material in the range of 10-3 S/cm. “If there’s a pipe with fluid, we would recommend a shield on the full length of the pipe as well as a grounding so it’s dissipated into the ground. Taking appropriate measures and precautions through the use of advanced materials will make the working environment safer for the personnel and will prevent losses occurring due to any damage of equipments.” said Poyekar. 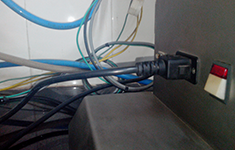 “Even in an ordinary switchboard, if we cover wires with this material and we’re reducing the chances of a loose connection sparking a fire to less than a few tenth of a percent,” she said. 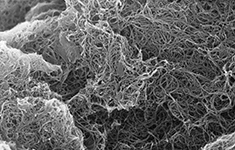 On a pure science level, the research is invaluable for its exhaustive critique and study of the dissipation of networked nanotubes in a polymer blend. In the real world, the material has wide electrostatic dissipation (ESD) applications, from packaging material for electronic goods, linings and shields in refineries, personal protection equipments for laboratories. This material can be very important in the personnel safety, industrial safety, and protection of goods. Graduate research scholars of IITB-Monash Research Academy study for a dually-badged PhD from both IIT Bombay and Monash University, spending time at both institutions to enrich their research experience. IITB-Monash Research Academy is a collaboration between India and Australia that endeavours to strengthen scientific relationships between the two countries. Project title: Dispersion and confinement of multiwall carbon nanotubes in immiscible polymer blends. Contact research@43.242.212.253 for more information on this, and other projects. The above story was written by Chhavi Sachdev based on inputs from the research student and IITB-Monash Research Academy.